Super-dee-whatever. The Nine of Cups is about Happiness. Now, this is not a good Hollywood Tarot archetype, because Hollywood is a darned cynical place. If you get this card: GOOD FOR YOU! 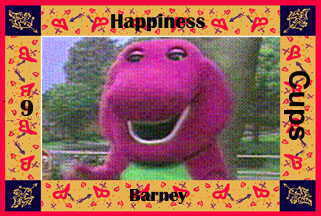 Happy Barney dances around at Barney the Purple Dinosaur.